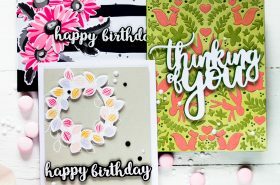 Today I’m honored to join Pinkfresh Studio April Essentials Release Blog Hop! 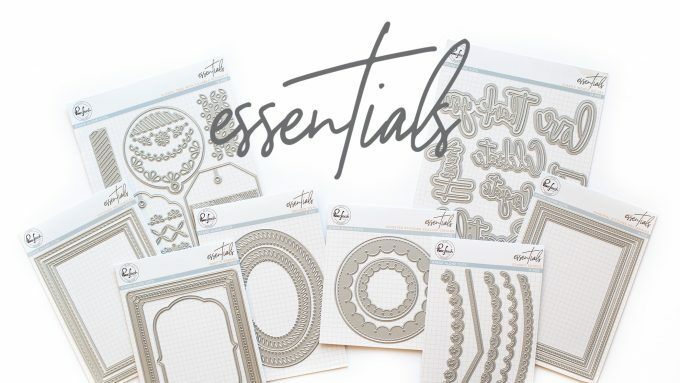 This blog hop is celebrating the release of new essential dies. You can find the full list of participants below, along with another info about prizes and special promotions. I made tree projects using some of the new dies and Pinkfresh Studio stamps. 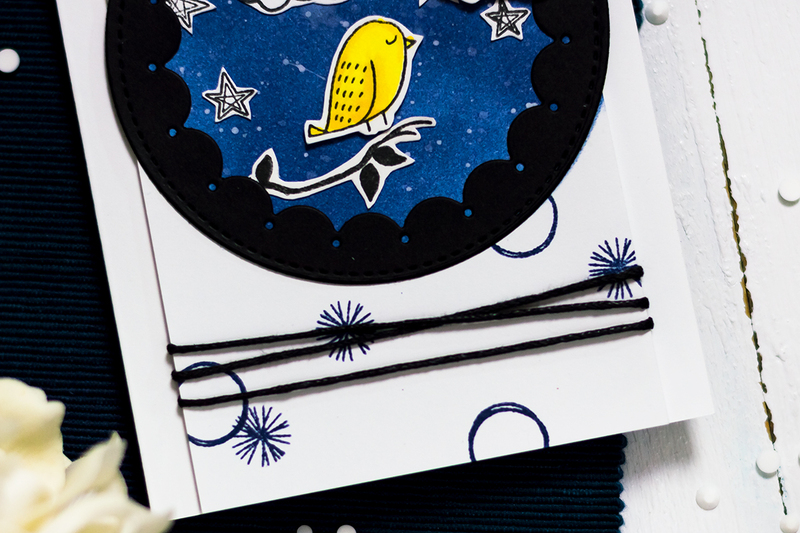 For my first card I used the Braided Ovals Die Set. The set has two dies which cut fancy ovals. And which can be nested, so for the bigger one you can create both an oval and oval frame. I did the second for my card by die-cutting the bigger oval out of a white cardstock first and then die-cutting the smaller one out of it to make the frame. To make this fun train I using the Train Ride Stamp Set. I stamped the train using red, mint and navy colors. After that I die-cut it using the matching dies. I made a card base out of a Robin’s Egg Cardstock and adhered the frame onto it. Followed by foam mounting the elements on top. Lastly I stamped the sentiment onto a white stripe and popped it onto the card. Me next project is Father’s Day Tag. To make it I used the new Classic Tags with Fillable Elements Die Set. This set is AMAZING! You can make almost an infinite amount of tags of different designs using this set. I decided to make a masculine project using this set. First I die-cut a tag out of a kraft paper. Then I added white and blue splatters onto it. I also die-cut the same tag out of a navy and white cardstock. I used one fillable element to die-cut a piece out of the nave tag. Which I then trim to make a stripe and adhered onto my tag. I trimmed to stripes out of the white tag, adhered one in the top part of and popped another in the bottom part. 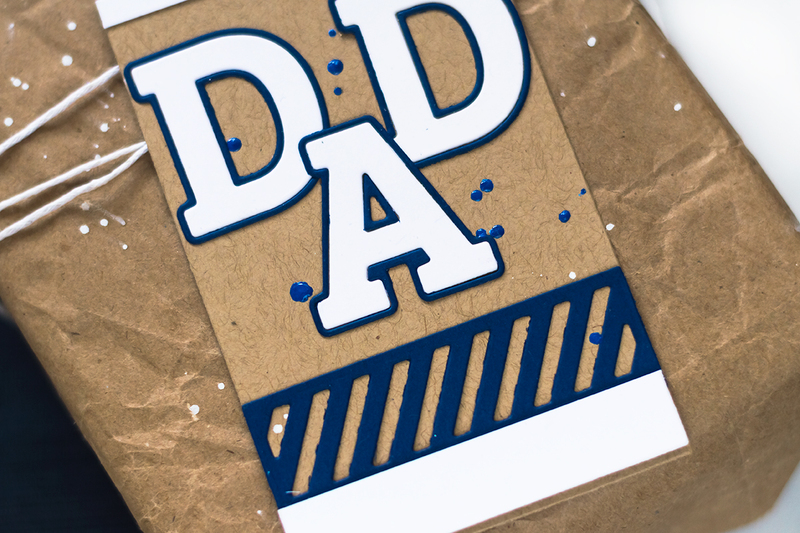 To make the word DAD I used the Adore Alpha Die Set. For my last card I used the new Inverted Stitched Scallop Circle Die Set to die-cut the black circle frame for my card. I made a panel out of a white cardstock and blended Sapphire Distress Ink in the top part of it (using the mentioned die negative die-cut as a mask). I added water splatter onto the ink blending, blotted it and then added white paint splatters on top. I stamped the rest of the background using stamps from the Birds and Bows Stamp Set using Navy Ink. Using the same set I stamped the birdie and branch and fussy cut them. I also colored the bird in yellow. For other elements of the card I used the Escape The Ordinary Stamp Set. 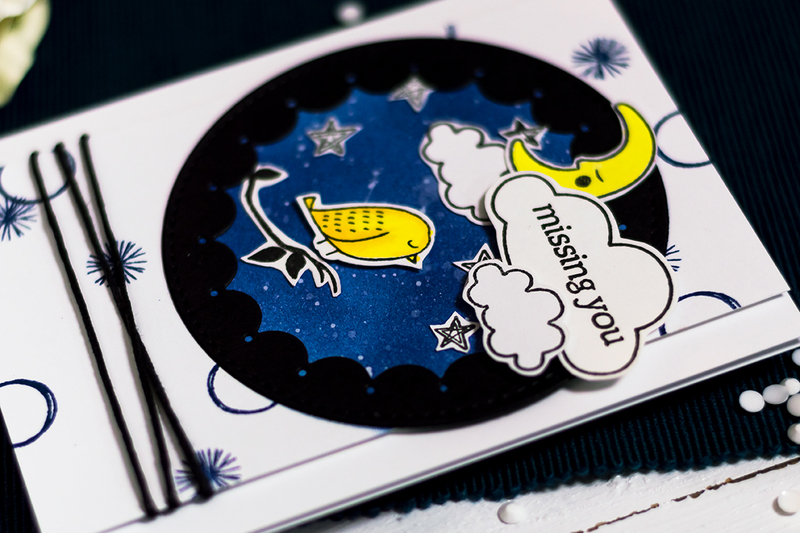 I stamped stars, clouds, moon and then fussy cut them. I colored the moon and adhered all the elements onto the panel. Lastly I tied a black twine around the panel and foam mounted it onto a white card base. There will be the full April Essentials release given away on the Pinkfresh blog, and on our IG feed. Also on each blog there is a $25 gift certificate winner picked from the comments. 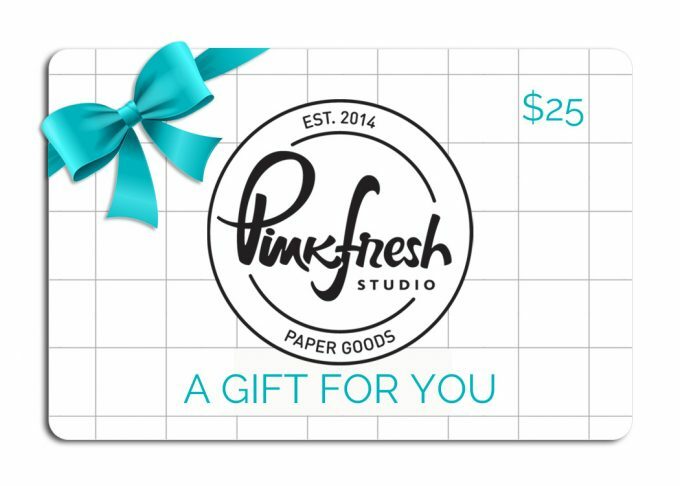 Winners will be announced on Sunday, April 14th on Pinkfresh Studio Giveaway Page. Please check that page to see if you’re a winner. And if you win you will have 2 weeks to claim you prize. 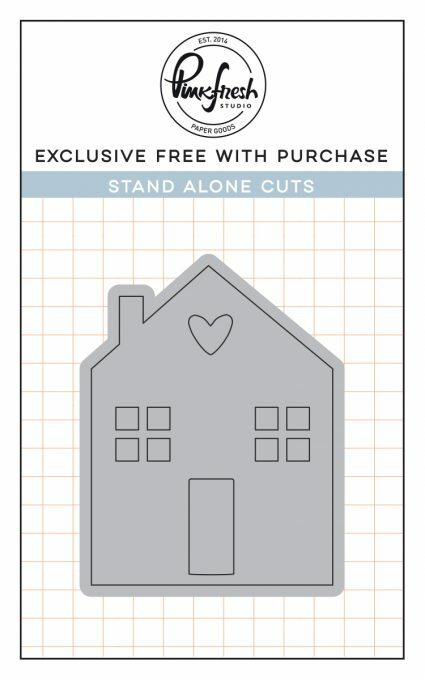 Free House die with purchase. There is no code necessary, and the die will automatically load into their cart. Pinkfresh Studio also is offering free/discounted shipping from April 8-11th on orders $50+ with the code APRESSFREESHIP50. Shipping is free in the USA, and $5.50 off for our International friends. 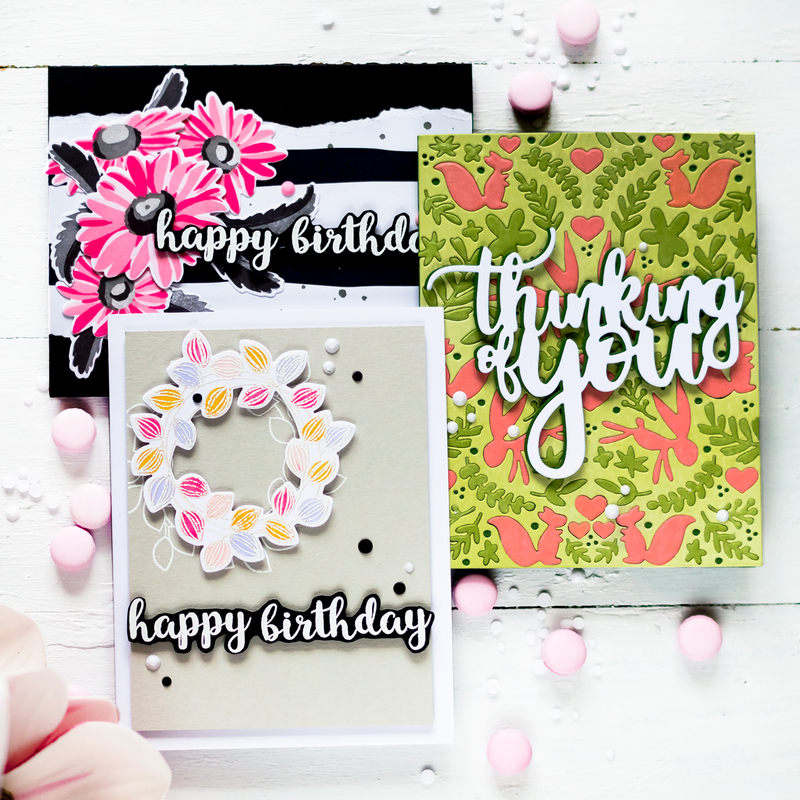 Beautiful tags and cards! I Love the Birthday wishes card! Great layers and colors! Loved your cards, they made me feel like a kid again, there’s something in them that made me miss my childhood. The train card reminded me of a kids tale and the Dad tag is simple yet very touching, I could tell it was done with love and a smile. 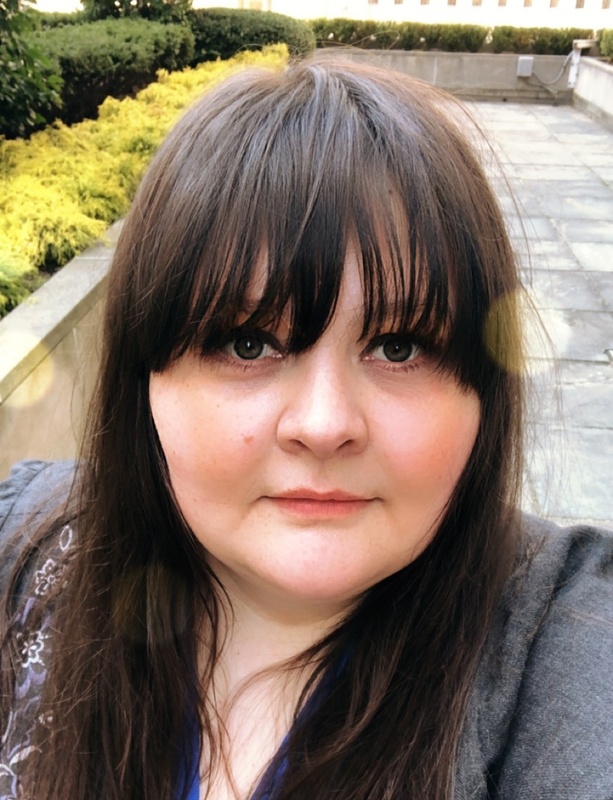 Svitlana, I can always count on you to make me see a set with different eyes! A train-track? Just brilliant! ALL brilliant! I love the Inverted Stitched Scallop Circle die, it really is a different look. Beautiful card! These dies are fabulous. Nice work. 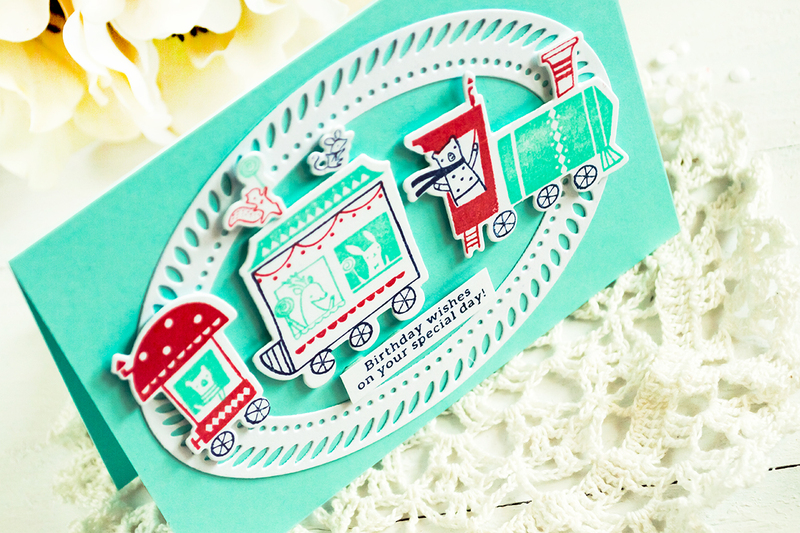 Love the use of the braided oval die and the train! How creative! They are all so cute. I especially like the train card. I just bought that set, and want to use it. I really like the dies you used to highlight the main focus. 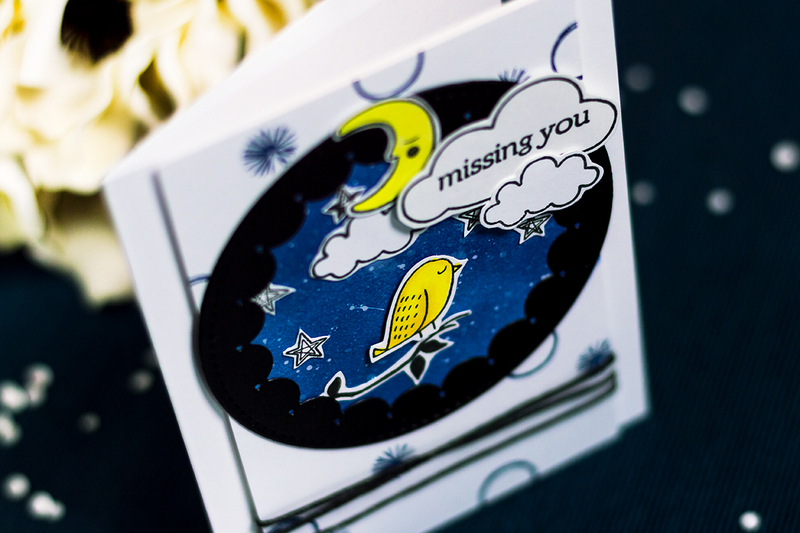 The Missing You card with the bird is great. I like the dark sky, shape of the sky, everything. I love all that you made! The train is so cute, especially framed by that oval. And I love your Dad tag. 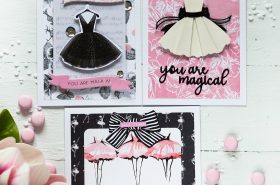 Adorable cards and tag! Great die release . Wow! Absolutely gorgeous cards and tag. Such a great release. These are lovely. I really like the masculine look of the DAD tag. Sometimes it’s hard to get ideas for guys. Beautiful projects and I love the fresh colors you used! Thanks for the inspiration! Beautiful cards. I especially like that you made the oval die look like a train track for your train stamps. Your cards are truly amazing and different from the rest of the group in an amazing way! How cute are those cards?! Love the masculine Father’s Day tag too. I’m in love with the inverted stitched scallop. It’s so unique. Awesome array of cards, Svitlana. The train of little woodland cuties is adorbs! And I’m always smitten when I see a birdie. Awesome cards and I love the tag! So fun and perfect for Farther’s day. You nailed it on the creativity prize! I love the train! 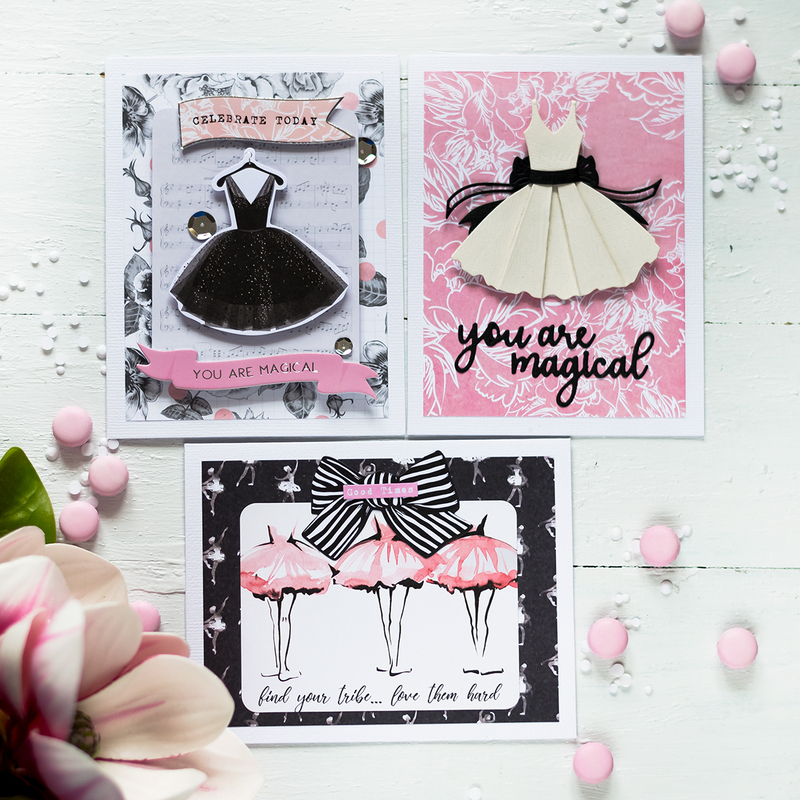 Fun cards, love your playful style! Wonderful cards. The Dad’s Day card is just perfect. Thanks for sharing. Great projects! I really love the Father’s Day tag! Cute use of the dies, really playful. Wonderful job as always. Thanks for sharing your creativity! These are so fun and creative. I LOVE how you used that frame as a train track-so clever!! Your cards are just so bright and happy!! 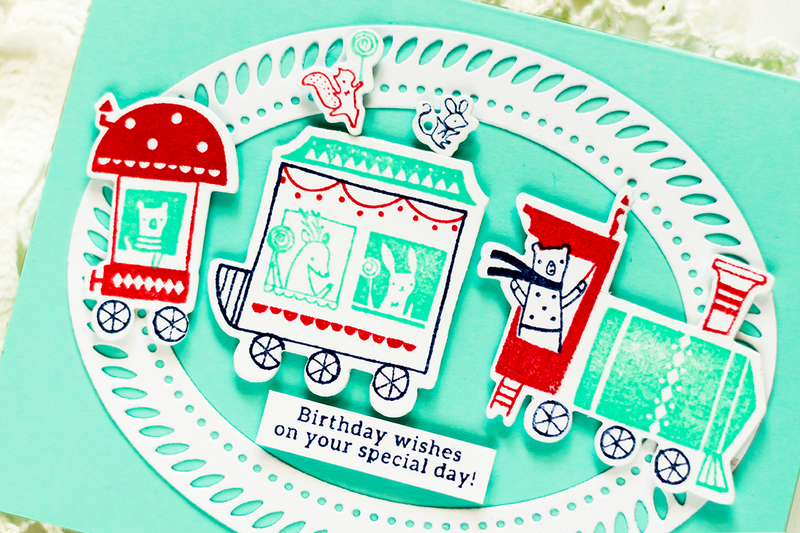 Such sweet whimsical designs paired with the new dies, so much fun! 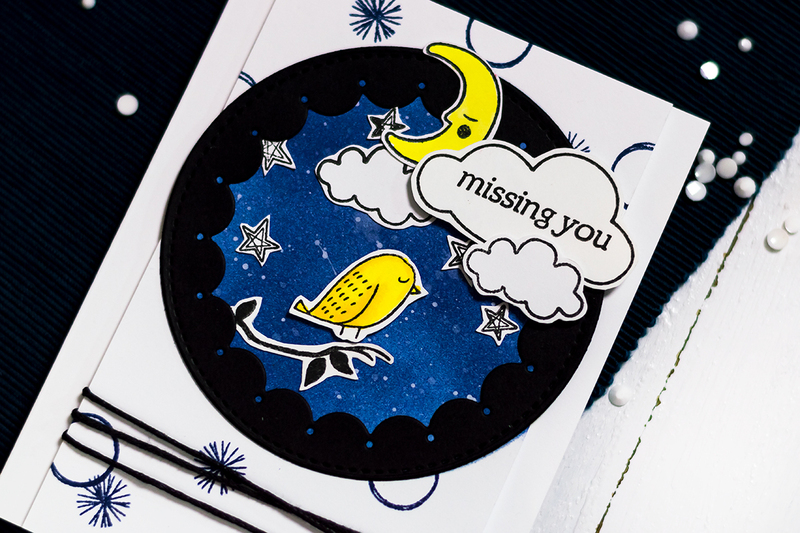 I love the great nighttime look on your last card! 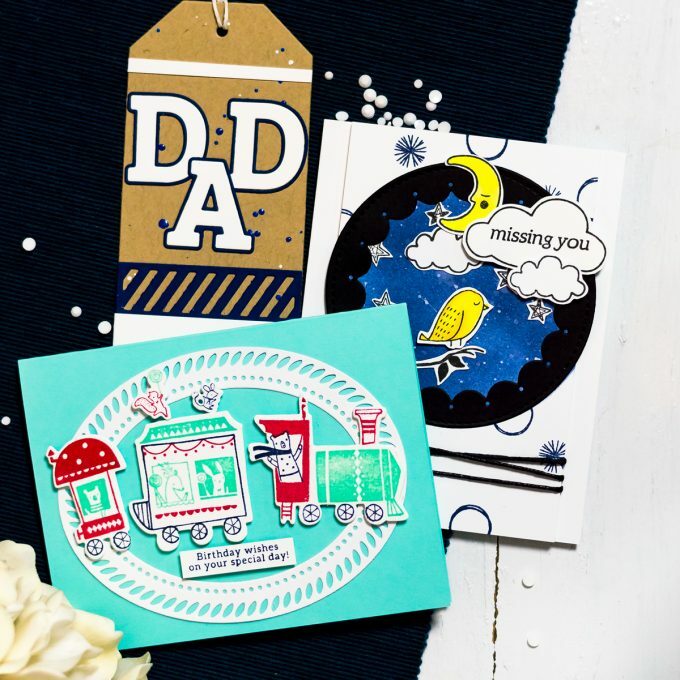 Great tag for Father’s Day and very nice and bright cards. Aaaw, the train card is so adorable and bright! A little boy would love that one so much! Especially love that adorable little bird! Oh so FUN! Our grand daughter just went on her first little train ride. How cute! Love that Braided Oval die, you used it perfectly! 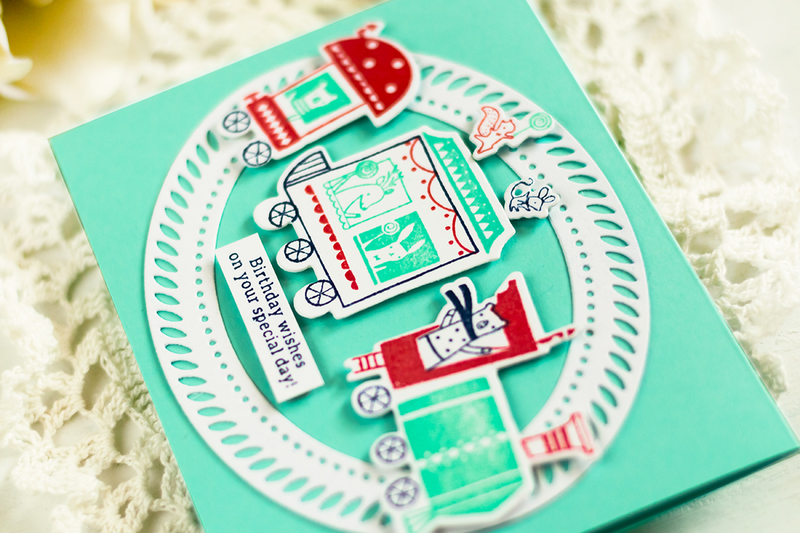 Love the train ride card – so adorable. 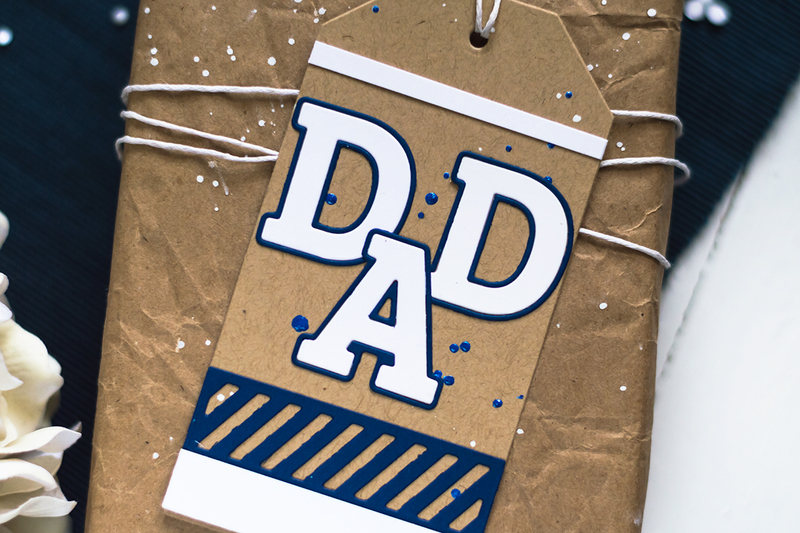 I always love seeing masculine cards and tags as well – love the Dad tag! What fun creations! I am loving the Tag set. Your masculine tag really shows it’s versatility. Loving the cool tags, thinking how great they would be in a photo album. Always love to decorate my gifts, I take a lot time buying the gifts that will make the person happy, why not wrap it that special way. The railroad card is darling. The die makes a wonderful track. You rocked this release! Such a wonderful collection of cards and tags! So cool! 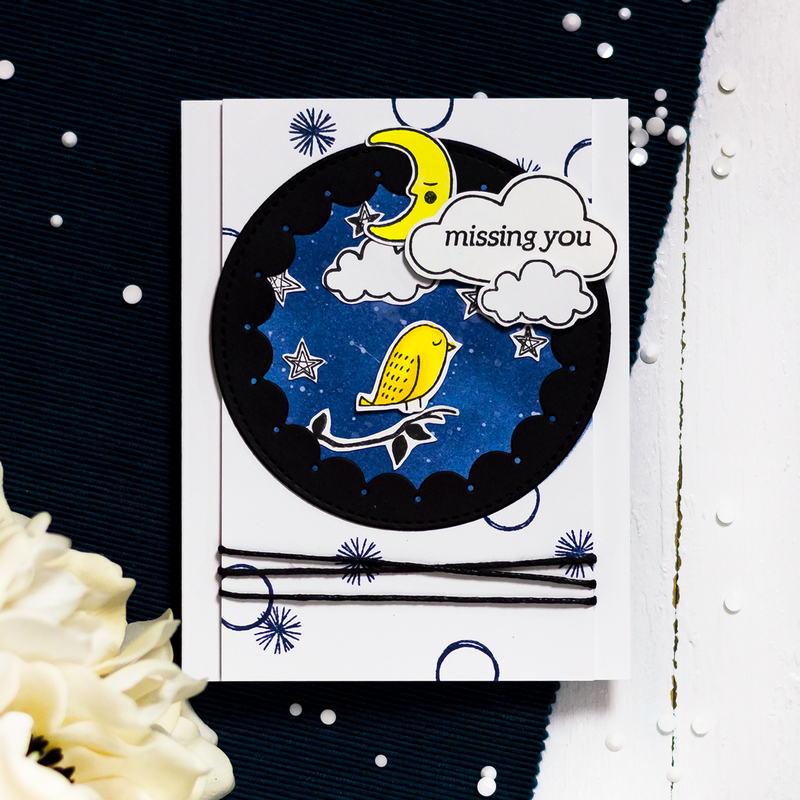 I especially love the “missing you” card! What an amazing release this is! 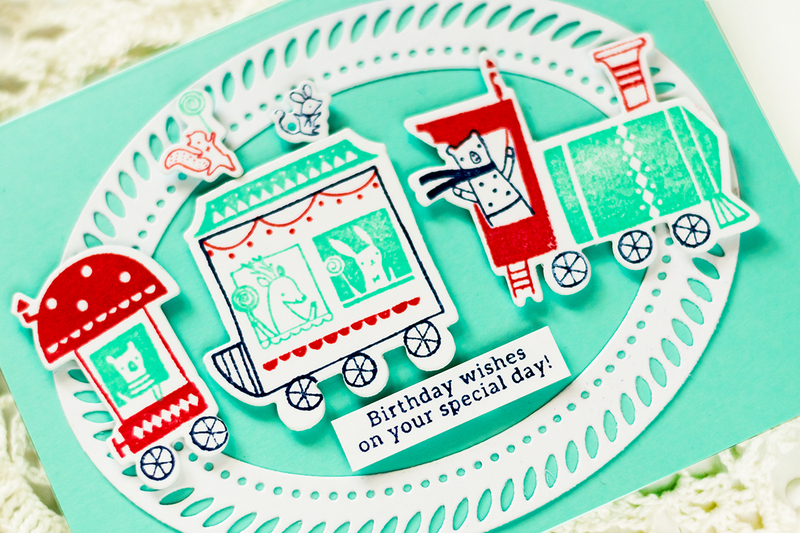 Genius to use the braided oval with the adorable little train set!!! Sweet. Great colors on the train~! 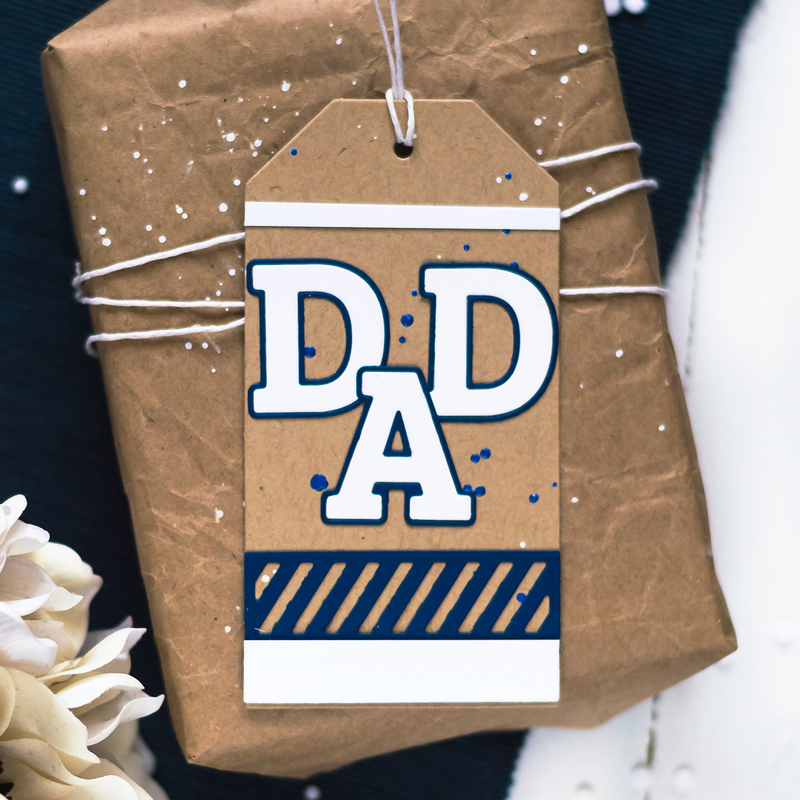 The Dad tag was timely and manly too! Love these projects!! The Braided Oval with the train is a great combo. It made me think of a train track. I can just picture that little train going around and around!! So cute!! Super cute projects!!! 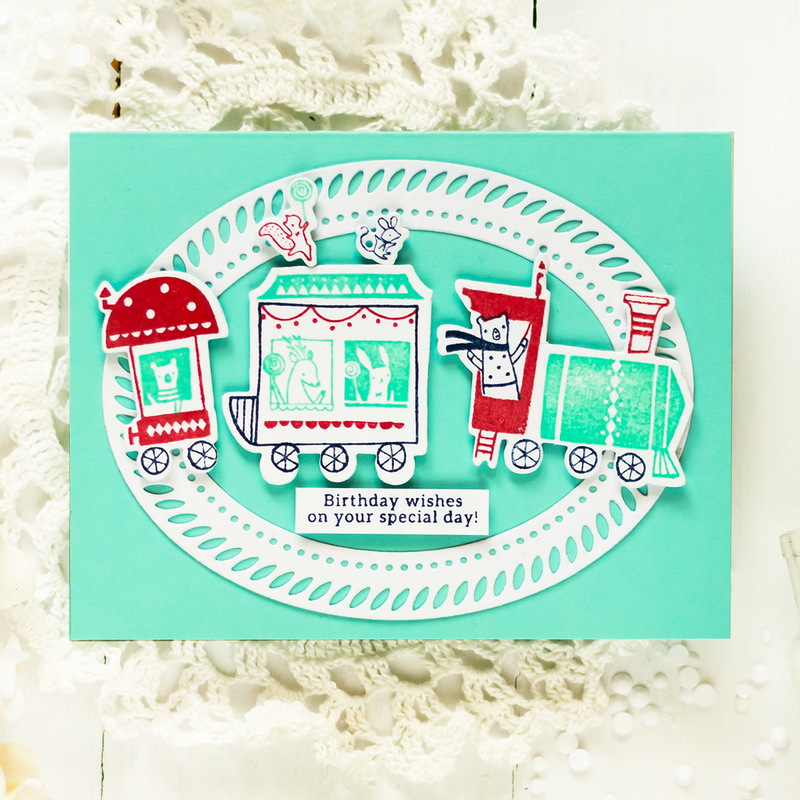 I love the braided oval with the train set…it works perfectly! and the colors are so fresh!!! Great cards! I can totally see that oval frame e resembling a train track. Great concept. Awesome creations! I love all of these pretty dies! The Braided Ovals are a favorite! Love your cards (especially the birthday one). This new release is amazing. 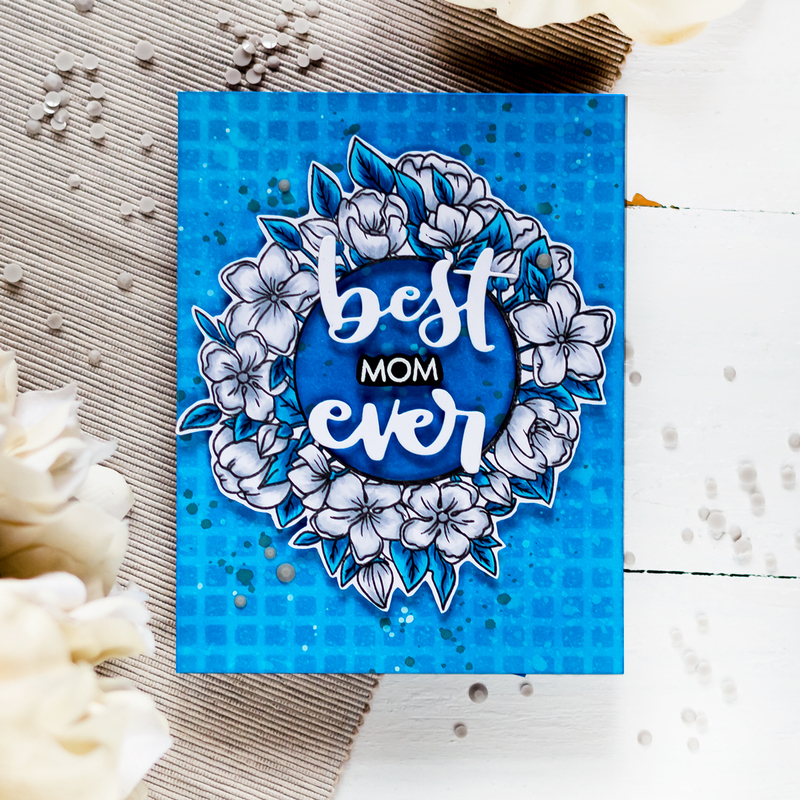 Beautiful cards and Dad tag, love that Inverted Scallop and Braided Oval dies, now I’ve got to add them to my wish list! Love the vibrant colors and the braid as train track is brilliant! I must say, your YELLOW bird card really made me smile! Wow! What a great combination of Pinkfresh products. The new release is fabulous. I really love the new sentiment dies. Oh how fun!!! I love them all!!! Sweet and delightful, love your designs!!!! Very cool cards! I love that train card, it is just too adorable! I love all of your projects! These are too adorable! You did a great job with the new release products. I like that the oval looks like a train track. I really like how you incorporated the Pinkfresh stamp sets into your projects. Just another great example of how nicely PF products coordinate. Thanks for sharing with us! Great projects! I especially love the tag die set and really like the fun Dad tag you created! So many possibilities with this set.